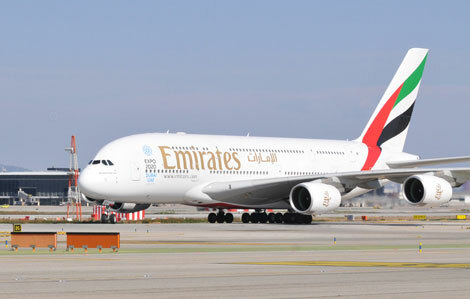 Emirates will deploy an A380 on its Barcelona route from February next year, it was announced today. The airline’s 517-seat superjumbo will replace the Boeing 777-300ER that currently operates the Dubai to Barcelona El Prat service. The switch, which takes effect on February 1, will result in an additional 2,198 seats between the two cities, an increase in capacity of almost 44 per cent. Emirates began daily services between Dubai and Barcelona, its second passenger gateway into Spain, last summer (see online news, July 2012). In February this year, the carrier operated two ad-hoc A380 services to meet the destination’s burgeoning demand. The 517-seat Emirates A380 offers 14 first class suites, 76 lie-flat beds in business class and 427 seats in economy.